Lovely collectible Susan Branch Cups, stamped on the bottom "Fine Bone China, Made in England." Imported from "the potteries" in Staffordshire; 16 oz. 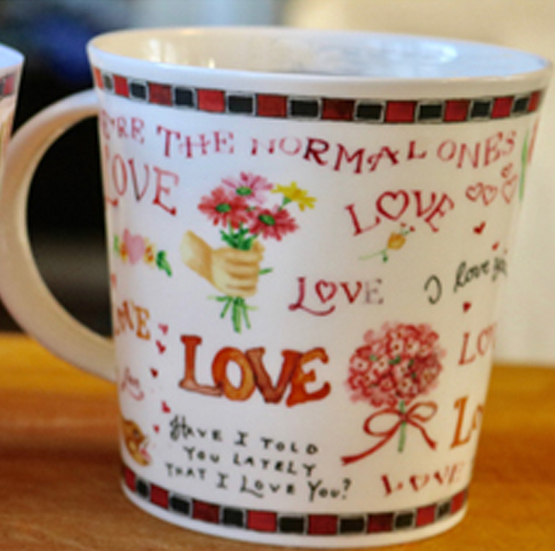 (filled to the very top), perfect for tea, coffee, hot chocolate, soup, stew, and Irish coffee (plenty of room for whipped cream), with Susan's charming art on each cup. Dishwasher and Microwave Safe. We plan to bring out new designs and retire the old ones periodically, so that Susan's lovely work becomes even more of a treasure, and collectible because of the small runs.